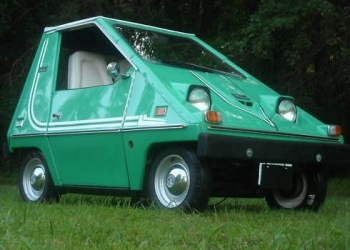 The CitiCar was a small electric vehicle, first produced in Florida in 1974 by a company called Sebring-Vanguard, partly in response to the mid-1970s fuel crisis. The CitiCar was a golf cart sized car that could go at a top speed of about 39 mph. Early versions had no extra features such as locking doors or air conditioning. In 1976, enough CitiCars were produced to promote Sebring-Vanguard to the position of being the U.S. #6 auto manufacturer after GM, Ford, Chrysler, AMC, and Checker Production of the CitiCar continued until 1977 with about 2,300 CitiCars produced. Commuter Vehicles, Inc. purchased the CitiCar design, and renamed the vehicle Comuta-Car. Production of an upgraded version began in 1979 and Commuter Vehicles, Inc. produced an estimated 2,144 Comuta-Cars and Comuta-Vans. At about 4,444 C-Car variants produced, it still holds the record for most road-legal electric cars made in automobile history. The CitiCar came in three models. The original Coupe was the smallest of the three. It had a flat diagonal front, a flat roof, and a flat nearly vertical back. Early coupes, designated as model SV-36, had a 2.5 HP motor and 36v battery pack. The second model coupes, designated as model SV-48, had a 3.5 HP motor and 48v battery pack, and numerous small improvements. During the last year of production, the third model variant of the Citicar had an improved drive train with a 6 HP motor, and the body was changed slightly to incorporate heater inlet vents on the side of the vehicle and permanently mounted side windows. 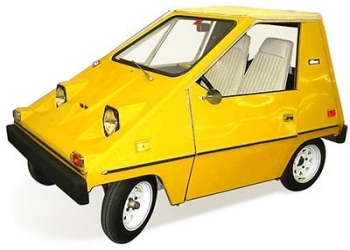 The later Comuta-Car, produced by Commuter Vehicles, Inc. retained the larger 6 HP motor and drive train arrangement, and moved the batteries from under the seat to the bumpers, making the vehicle about 16 inches longer than the 8-foot long CitiCar. Another CitiCar variant was called the CitiVan, or Comuta-Van. The overall length was increased to 142 inches, and it had a 12 HP motor, 72v battery pack, and 3-speed transmission. It still held two passengers, but also had room for storage. It was the only model with a trunk and sliding door. Many Comuta-Vans were built with right-hand-drive for the US Postal Service. All vehicles were built with welded aluminum pipe space frames and ABS plastic bodies, with solid axles and leaf spring suspension front and rear. Top speeds were about 30 mph - 50 mph, and range was up to 40 miles per charge.